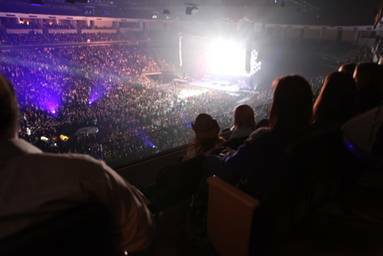 We are committed to providing you and your guests with a memorable experience from the most exclusive seating in the Arena. Any one of our Premium Suite Packages will provide a unique experience complete with first-class amenities and exceptional service both you and your guests will thoroughly enjoy! Marquee package: 12-14 tickets to all Arena events including: Gwinnett Gladiators hockey, concerts and family shows, plus 3 parking passes and in-suite catering options. Build-Your-Own-Series package: A customized 3-series or 6-series package with 12 tickets to any event of your choice including Gwinnett Gladiators hockey plus 3 parking passes and a food and beverage package included. Rock 'n' Ride package: Georgia Limousine presents Rock 'n' Ride package to enjoy a night in style with 12 tickets to an Arena event plus 6 hours of luxury limo service. Packages begin as low as $85 per person. Suite Life of Luxury package: Come celebrate in style with our exclusive 30-person luxury party suite. Whether you are coming for a corporate outing, a family birthday or just a group of friends enjoying a concert, this suite serves as the perfect atmosphere for entertaining! Our party suites provide excellent seating along with a separate bar area and private restroom. We offer outstanding food and beverage options from a variety of different packages, along with 30 tickets to your selected event.